I came upon this book by accident and, although it has been said many times that one should not judge a book by its cover, it was the front cover dabbed in red that grabbed my attention. Good color choice, I must say, for there was no mistaking about it: I immediately fell in love with the book. The first page is a teaser to what the reader might expect to find in the rest of the pages. It features the seemingly valuable “sulking seat” where, as the name implies, princesses can sulk all day, “perfect for small snits.” It was, for me, a delightful treat – enough to make me want to uncover the princesses’ best kept secrets while having a good laugh. Everything about this book is visually stunning – color, illustration, various fonts and font sizes, and page layout. French graphic artist Rebecca Dautremer brings each page to life with her gouache technique. Gouache is a painting medium that uses opaque watercolor mixed with gum substance. Shades of red and green dominate the picture book. Flipping the pages feels like going through a postcard collection, with each spread telling a story of its own. As talkative as a parrot and impossible to understand, she chatters about everything and says nothing… However troublesome in times of peace, though, [she] is appreciated during times of war… As effective as a cannon, her babbling has been known to cause even the boldest enemies to flee. She wears the most eccentric outfits… She is talked about wherever she goes. Her only fear: to be ignored. Her only desire: to be adored. No one knows who she is… However she exists. Write to me if you have any information. What adds to the fun is the short what-kind-of-princess-are-you quiz located near the end of the book. Of course I did not miss the chance of answering the questions. (According to the answers I got, I am “without a doubt the most tender princess.”) The quiz makes you feel like you are part of the story. 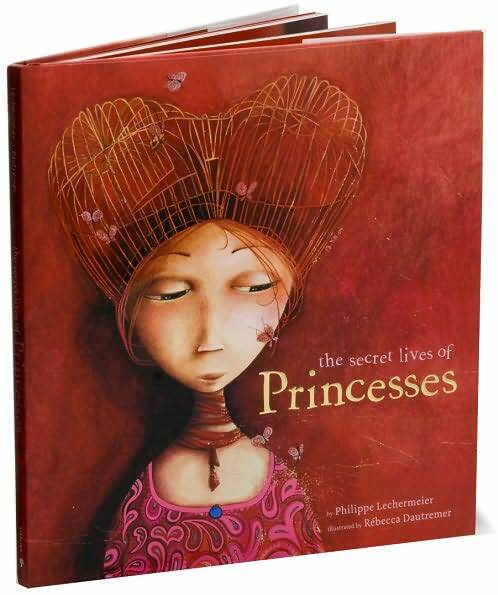 As a matter of fact, I think that the book is trying to convey the message that there’s a prince/princess inside all of us, and that is a very encouraging thought. The Secret Lives of Princesses is a certified gem. You are definitely getting more than what you paid for. It is one of those rare finds that are worth every penny. Sounds very interesting and indeed the cover is just beautiful… caught my attention too. thanks for dropping by. I saw the pages on the official site of the book, its beautiful indeed. Hi Fats, I just borrowed this book from the library – and I have fallen deeply in love. I will let you know what kind of Princess I am as soon as I finish the book. I LOOOOVE it! Do you have your own copy???? Lucky you! The illustrations are gorgeous! And the lines are all so refreshingly witty and well thought out. Oh why did I wait so long to borrow this book? It’s beautiful!